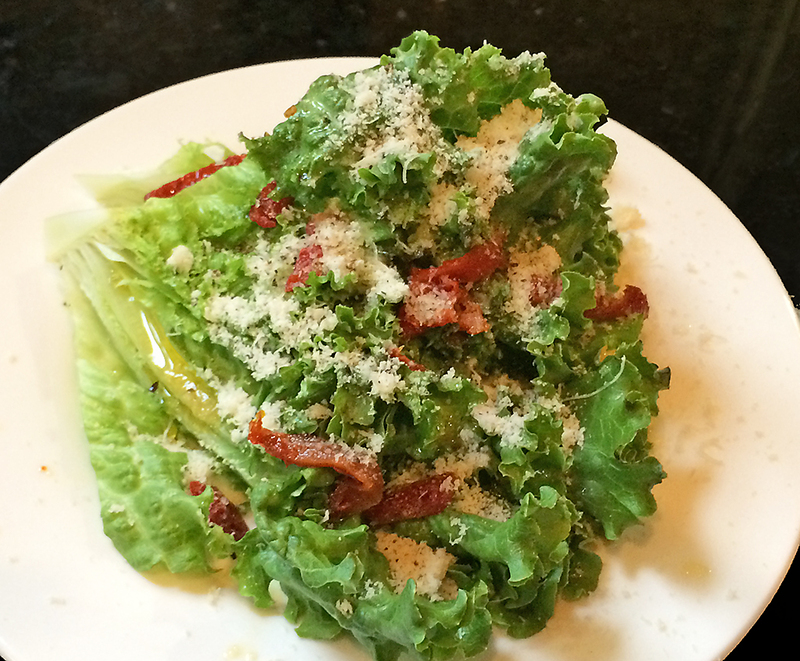 Get a “wedgie”, Wedge Salad that is! I was looking to do something a little different that would make a good presentation, quick to assemble and tasty. First an editorial comment on lettuce … I’m sure there’s a more boring vegetable than iceberg lettuce, but I can’t think of one right now. Even our humble Ferguson Shop N’ Save has a good variety of lettuces to choose from … don’t be boring people! For this salad I grabbed a head of green leaf lettuce. It was a good-sized head so quartering it yielded an ample serving for everyone. I wanted a warm dressing for this salad. Bacon drippings are the common ingredient for warm dressings but I didn’t want to go to the trouble of cooking bacon. Fortunately I’ve been cooking bacon in the oven on a foiled-lined baking sheet for several years now and made it a practice to keep a ceramic bowl in the freezer to receive the hot drippings. The frozen bacon drippings come in handy for a lot of things. With a sturdy knife I chiseled out a few good chunks of solid bacon drippings and started melting them in a small saucepan. To convince myself that I was eating healthy, I mixed in an equal amount of EVOO to dilute the fat content, without losing too much of the flavor. Next in the saucepan went several tablespoons of Julienne cut sun-dried tomatoes packed in olive oil. I let them simmer for a few minutes and gave them time to get acquainted with the bacon drippings and olive oil. While they were sharing secrets and flavors, I took the opportunity to grate some parmesan cheese. After drizzling the lettuce with the warm dressing, I topped it with a little coarse ground black pepper and the grated parmesan. Guaranteed the best “wedgie” you’ve ever had! If you do have time to cook up some bacon, a little crumbled on top of this salad would be divine!